Kevin offers a free medical check-up for all new puppies and kittens. Many puppies and kittens have already had their first vaccine with the breeder before homing. 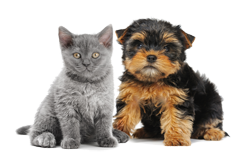 We encourage our clients to bring their new pet in as soon as possible so we can check them over and discuss issues such as diet, worming , insurance, as well as checking for fleas and any other problems. Puppies : From 8 weeks old. We strongly advise the vaccination of all puppies against the five serious infectious diseases. Canine Distemper, Infectious Canine Hepatitis, Leptospirosis, Canine Parvovirus, and Parainfluenza Virus. Kittens : From 9 weeks old. We strongly advise the vaccination of all cats against Feline Viral Respiratory Disease (cat flu) and Feline Infectious Enteritis. We also advise that all cats that go outside receive vaccination against Feline Leukaemia as well. We advise that all puppies and kittens are microchipped and we usually do this at the time of the second vaccination. A microchip is a device within a small silicon bead about the size of a grain of rice. It is easily implanted by injection under the skin. Each one has a unique number to be registered with your details. This allows identification not only if your pet is lost or stolen but is also a mandatory requirement for travel under the pet passport scheme. Furthermore, microchipping will become compulsory in 2016. We hold free informal puppy parties by arrangement for our puppies between 10 and 16 weeks of age. This is an excellent opportunity for the puppies to meet and socialise with other pups and also for the owners to discuss with one of our staff any health or behaviour issues they may be having. Please talk to reception staff for party dates and times. Kevin recommends that all puppies and kittens are insured soon as possible for at least a year or two as. Puppies and kittens can get into all sorts of mischief and accidents when they are young. Insuring them for at least a year allows the owners to make a more informed decision based on their health and behaviour when they are fully mature.